The Russian Blue cat’s Origins are left to stories and legends. A distinctive plush double coat sets this breed apart. Once called the “Archangel cat” or “Foreign Blue” they came by way of England in the 1860’s and have ties to Royalty. The breed is thought to come to the USA in the early 1900’s after World War II they drew an American following. 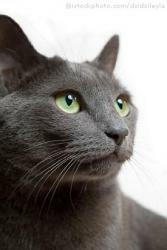 The Russian Blue is always blue with short hair and green eye’s, unlike other breeds with a variety of colours. They are fine boned and long bodied. The distinct colour and coat stands out as does their normally affectionate nature. They are normally quiet, somewhat shy cats but with those they know and trust are devoted and affectionate. They are also very intelligent cats! These are the cats that lean to open doors and sense the mood of their owners. They are low maintenance from a grooming point but do enjoy a brushing.